The bunny is out back tonight, sitting under the bird feeder. He's (she?) just sitting - I watched it for a little bit, through the binoculars, and all that moved was its nose. It was pretty calm too, not running away when I went out the loud porch door to bring in my lettuce planter (it might freeze tonight). Someday I would like to have another bunny as a pet. When I was small we had one that I don't remember - we have pictures though - that apparently bit me. Later, I had a spotted mini-lop named, officially, Bunnicula, Bun Bun for short, who was what might be called a free-range rabbit. He had the run of the house and yard, and spent a lot of time eating my mother's plants, pooping behind the furniture, and terrorizing the cats. He also ate the spines off all the Agatha Christie mysteries and children's books on the bottom bookshelves. I was supposed to be in 4H with him, but after a couple of chaotic rabbit shows, he was deemed to have the wrong shaped head, and 4H was abandoned. When we got Smokey, Bun Bun had to be kept in his cage (he looked an awful lot like dinner to the dog), which he did not like, after his years of unrestricted freedom. Eventually, he went to be a shop rabbit at a carpenter friend's shop. We tried one more rabbit when the youth pastor at church had one he couldn't keep. This rabbit was named Mozart, and was used to being in a cage. Unfortunately, he too looked like dinner to the dog, and had met a sorry end when he dug out of his special lawn cage in an unattended moment. The question is, will I ever have a dog I can train not to eat the rabbit? I know it is possible - Sheila, Benjamin's step-mother, did it with her German Shepard - but he was a very smart, very well-trained dog. Ah well, for now I can just enjoy watching the bunny in the backyard. Are you a sound sleeper? Do you have trouble getting up in the morning? If so, try this innovation: get a couple of cats, train them to want breakfast at a certain time of morning, then start lengthening the days. Works a treat. Cleo and Oliver have taken this regimen to heart and applied it to us this weekend. Oliver would start meowing and singing around 5:45 or 6, then after about 20 minutes, Cleo would begin a sort of steeplechase, or rather people-chase. This involved racing across the foot of the bed, then dashing up to the head of the bed and running across, just above our heads. Occasionally, she would stop the running to meow and purr, staring intently at one of us. On Saturday, Benjamin enacted a sleep alarm of sorts by locking them out on the porch - too bad we were both mostly awake already. During the winter, when it was dark until 7 or 7:30, the cats were mostly quiescent, patiently waiting until we managed to drag ourselves out of the warm bed. Sigh - one of the perils of spring. In other spring news, the canal is now full once again - it seems too full, after being so low for so long! And I saw the first bunny of spring in the backyard this morning. Didn't see a single one all winter - where were they hiding?! A spring walk is a completely different experience from a winter walk - a fact I knew, but hadn't really lived until this year. Winter in Bellevue is generally only different from spring in that it is darker, and maybe colder - with all the evergreens and the lack of snow, the landscape doesn't really change much. In Texas, apart from the occasional ice storm, winter doesn't look all that different from the other seasons. But here, we had 5 months of snow storms and cold. The landscape is reduced to white and gray, windblown snow providing most of the visuals. There are birds, but apart from the resident ducks, they tend to stay hidden and quiet. Mostly, a walk in the winter is cold. You certainly know it is winter, and that it is a distinct season. But spring! Spring uses all your senses. The birds are all singing, the flowers are blooming - a feast for the eyes and the nose. I mean, snow has a smell, but it isn't particularly interesting after 4 months... Every day something new has sprouted or bloomed or grown. Yesterday I noticed magnolias and dandelions, and many trees have actual leaves now. Soon there will be lilacs - one of my absolute favorites. Even the wind has changed - instead of howling down the canal path, forcing its way into your clothes through the tiniest chinks, it ruffles your hair, provides a little relief from the warmth of the sun. Rain feels like a blessing instead of a curse. In honor of Earth Day, here are some pictures of flowers from our garden. Crocuses - this picture is from last week, and these are pretty much gone now. They don't last very long. 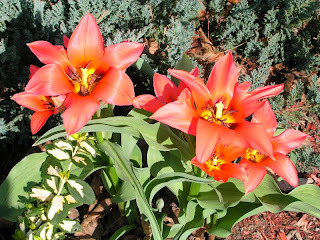 Interesting tulips - they open all the way up in the sun, like morning glories or something, and then close up in the late afternoon. Tree bud. Not sure what kind of tree this is - maple or honey locust probably, since those are the most prevalent around here. For once the close-up zoom feature on the camera focused on the object I wanted it to! Now, go plant a tree or some flowers, and pick up some trash. Birds I saw and/or heard on my walk this morning: Robins, seagulls (perhaps they ought to be canal gulls, this far from salt water? ), ducks, Canada geese, red wing blackbirds, blue jay, cardinals, some kind of woodpecker, finches, chickadees, sparrows (I am not a fanatical enough birder to try to identify exactly which of the bewildering number of sparrows we have here), starlings, possibly a grackle or two, possibly waxwings, possibly a swallow (of these last three, my glimpses were to brief to be conclusive). I will probably see at least one hawk on my drive in to work. Flowers seen: violets growing in lawns and in the grass on the side of the canal path, daffodils, mini-daffodils, hyacinths, tulips, forsythia, some sort of flower that looks like a hyacinth but with bigger flowers and less scent (my mom would probably be able to name it if she could see it). The water level in the canal has started to creep upwards as predicted. 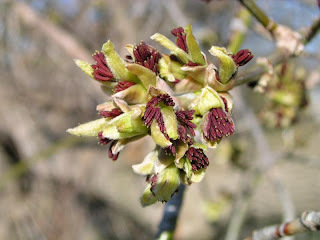 Please pardon yet another post about the joyousness of spring! We are having absolutely wonderful weather this week. It is sunny, cool in the morning and warm in the afternoon. Birds are singing, trees are budding, flowers are blooming. In theory, the canal will soon be refilled, since opening day is May 1st. There is a lilac festival coming up in May. The farmer's markets all restart in a couple of weeks. No doubt about it, spring is better after several months of cold and deprivation! I have been taking pictures of everything, but haven't had a chance to get them off the camera - soon, I promise. I apologize for the lack of pictures in my posts lately. It is just that the end of March is not a particularly interesting time for photos - the snow is gone, but nothing is growing yet. It has been rather colorless and uninteresting. That is changing, thank goodness. There are bulbs of all sorts sprouting in our yard - most of which I did not plant - and in other yards. Here is one of the first in our front garden. 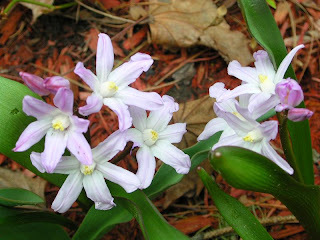 It is a chionodoxa; I have never seen it before, at least knowingly, but I bought and planted a bag of them in the fall. Soon to follow will be some crocus, tulips, hyacinths, and daffodils. This is our new table. Mom and I found it at Goodwill this past week for $25 - she said it probably should have been priced higher, because it is in very good shape and is very sturdy. 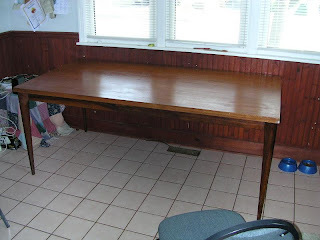 It replaces our makeshift desk table, which is really too narrow to comfortably seat more than two people. Lately, Oliver has been causing problems because he wants to look out the kitchen windows during breakfast - which means he ends up walking all over my newspaper or the computer. Now, he has plenty of room. After many months of work and waiting and tension, we finally know where we will be in the fall. Benjamin has taken a job at the University of Central Arkansas, in Conway, Arkansas. It is about 30 minutes northwest of Little Rock. It is a tenure track job, so we won't have to go through all of this again for a while. So, we will be starting a new adventure in August. Please don't mention the heat, humidity, snakes, tornadoes or floods - we've heard it all from my mom. The area is nice, close to the Ozarks, with many hiking and outdoor activities nearby. I should be able to have a great garden eventually, and we should be able to afford a good house. Winter is truly on its way out - the woodchucks are out in force. We have two (or maybe more by now) living under the front stoop. I have spotted several more on the canal berm in the back yard. They are thinner than in the fall, but that will probably swiftly be remedied. As I type, one is sitting on the steps up to the canal, sunning itself and munching away on something. I can see it, because it is warm enough to sit out on the porch again, for the first time since October. The cats are very pleased about this - I think they were suffering from cabin fever! Neither Cleo nor Oliver are allowed in the actual outdoors unchaperoned (Cleo doesn't have claws, Oliver is agoraphobic, and both are big sissies), but they sure do enjoy having the larger vista provided by all the windows. Creamsicle, who is allowed outside, seems pleased with her renewed ability to go exploring without freezing her tail off (must remember to get a collar for her soon). I don't know how long this lovely weather will last - it is supposed to be cold and rainy by the end of the week, or how long it will take to return again, but I sure like it! Spring, really, I mean it this time! Seriously, it is finally starting to be spring around here. The snow is gone, except for a few piles in parking lots and really shady spots. 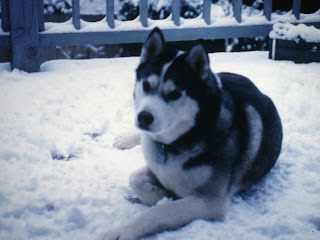 There is still the chance we will have another storm, but the days of snow everywhere are over for another year. 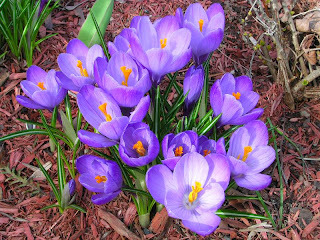 There are birds all over the place - geese flying north, starlings, cardinals, finches, jays, sparrows, robins, doves... And best of all, the bulbs are starting to poke up out of the ground. The crocus and snow drops are actually flowering now. The sun is out today, and we have windows open. When we went for our weekly walk to the library, I didn't need a hat, or gloves, or even a scarf. Hurrah! I happened to be visiting my cousins one April 1st (must of been spring break) and my aunt decided to play a joke on my uncle. So, she took a couple of new sponges and covered them in frosting, making them look like a small cake. When my uncle came home from work, we offered him the cake to cut, then cracked up when he couldn't. It really appealed to my elementary school-aged humor. My grandmother called me one April morning when I was in college, and very convincingly told me that she had seen a jackalope in her back yard. She was completely honest sounding, and as one not know to play jokes, it was hard to not to take her seriously. If you have never seen or heard of a jackalope, it is a semi-mythical animal that looks like a combination of a jack rabbit and an antelope. Here are a couple of articles about them: Museum of Hoaxes, and Wikipedia. If you google the term, you will also find plenty of pictures.